We are proud to announce a Raptor Identification class being taught by members of CARRI and members of the Rocky Mountain Wildlife Alliance. Click the image below to attend. See you there! This video was created by Mr. Tom Bradley. It is the story about our director Scott Rashid and how he became interested in birds. We are pleased that we are partners with Rise Broadband, Boulder Audubon Society, The city of Loveland, COLORADO,the city of louisville, COLORADO, Colorado Parks and Wildlife and the Rocky Mountain Wildlife Alliance. To study the ecology of birds within the Estes Valley and Rocky Mountain National Park, with a special emphasis on hawks and owls. As the institute grows the research will expand throughout the state of Colorado. To provide information about the species' natural history, abundance, survival and breeding success. To educate and inspire the public about avian conservation by assisting them in making informed conservation-minded decisions. To share the findings of the institute with the scientific community and local government agencies and provide tools to them for stewardship. To focus on the rehabilitation of injured and orphaned wild birds by nurturing and caring for their needs, while retaining their wild instincts, which will in turn enable them to be released back into the wild and remain a part of the viable wild population. Below are just some of the injured birds that we received in the past. From left to right; the Sharp-shinned Hawk flew into a window, hit his head and had a concussion. The Hairy Woodpecker flew into a window as well. 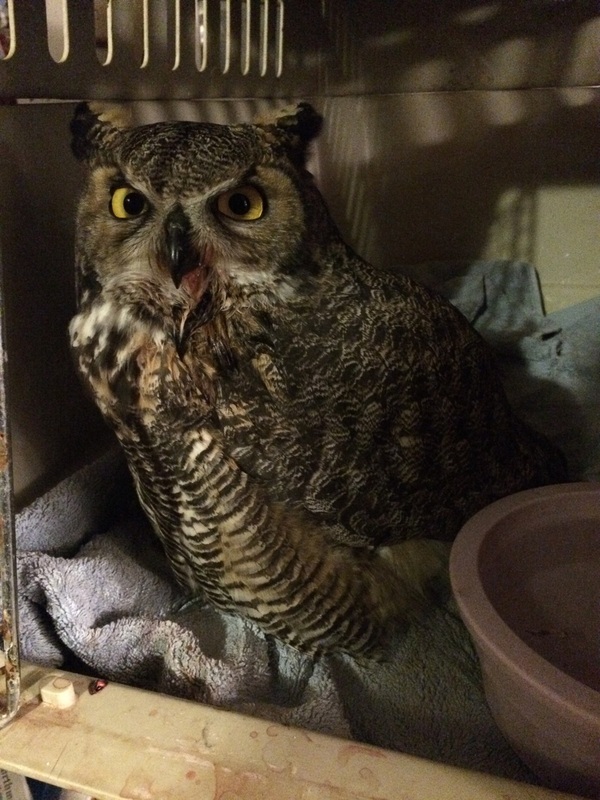 The Great Horned Owl was hit by a car and the magpie (far right) was orphaned. Above is a video of CARRI's Director, Scott researching Northern Pygmy-Owls. Enjoy. Each year we monitored several Barn Owl nests, several American Kestrel nests, Northern Pygmy-Owl and Northern Saw-whet Owl nests. We will be monitoring bluebird and swallow nests as those birds begin incubating. We will also be rehabilitating birds as they arrive at the institute for care. CARRI has three major areas that are in need of funding; 1) Research, 2) Education and 3) Rehabilitation. 1) Research: We would like to purchase the materials for, construct and place 10 more Barn Owl nest boxes, 10 Great Horned Owl nest structures, 10 Eastern Screech Owl nest boxes and 10 American Kestrel boxes, placing cameras inside as many as we have a wifi connection for. We would like to find individuals and corporations willing to fund such projects. We would place nest boxes on or near private structures such as garages, barns etc. as well as large office buildings enabling CARRI and the public to learn more about these species as well as enabling the birds to do what they do best, which is to create natural pest control for the environment. 2) Education: We are very interested in educating young people and adults about the importance of conserving habitat for birds. By talking to grade school, middle school and high school students as well as conservation groups, we can work with them to construct and place nest boxes and platforms for raptors and songbirds such as bluebirds, wrens and swallows. 3) Rehabilitation: CARRI's other major focus is the rehabilitation of injured and orphaned birds. Each year CARRI receives numerous birds that need care. Some are found on the ground and assumed to be orphaned. Others have injuries ranging from minor scrapes to major trauma. This care often takes several months and is quite costly. Your generous donations will aid in the care of these birds and their release back into the wild. CARRI works locally with Law Enforcement, Animal Control and Colorado Parks & Wildlife, in the recovery, rehabilitation and release of injured birds.